The Thursday Musical Club was founded in 1918 by Mrs. Anna Scott Newhall, wife of prominent San Rafael businessman, Almer Mayo Newhall. 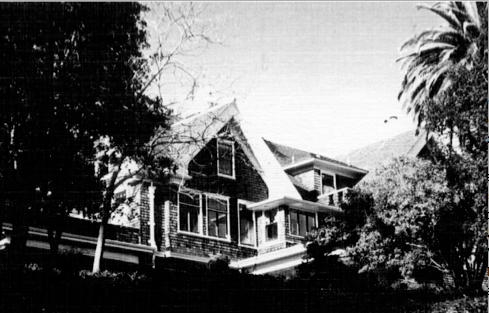 The Newhall’s residence, Newhall Mansion, is still a San Rafael landmark at the top of winding Newhall Drive. Inside this home, the large stairway landing accommodated a grand piano and served as a stage for the musicians. One can just imagine in those early years the horse-drawn carriages traveling up Newhall Drive to deliver elegantly dressed ladies for an afternoon of music and tea. The name, The Thursday Musical Club, continued a tradition at this time of history since there were sister clubs in various cities on the West Coast. Members performed for each other and their friends in elegant settings. Sometimes there were skits and readings as well as classical music. Mrs. Newhall served as the club’s president from 1918 to 1929. Among the earliest members were: Mrs. Lynn Townsend White, Mrs. Norman S. Halsey, Mrs. Clifford Pitcher, Mrs. Herbert Brainerd, and Mrs. Raymond Thayer. The dues were $1.00 per year for members, and 25 cents each program for guests. The group met on the third Thursday of the month from October to May, skipping December. This scheduling tradition has continued for 98 years right up to today. After Mrs. Newhall moved to San Francisco in the early 1930’s, the club tried meeting in public halls, but the membership soon realized that chamber music was best enjoyed in the intimate setting of a private home. Mrs. Frank Howard Allen began asking musicians outside the club to perform. Children of the members, Junior Members, also performed. Kay Adams, an early member, once recalled that she and Elizabeth Miller would bring cups, saucers and chairs to the meetings in Elizabeth’s big station wagon. The growth of the club necessitated in the rental of chairs. At one time the chairs were borrowed from Crockett Undertaking Parlor, if no funeral was scheduled on that day. Longtime member, the late Helen Caletti, once spoke about all the historic beautiful estates and mansions where meetings were held throughout Marin County. The exquisite homes of Mrs. Norman Livermore, Mrs. William Kent, Mrs. Herman N. Mangels, Mrs. Furlong, Mrs. Carlos Freitas, Mrs. Harrison M. Leppo, Miss Louise Boyd and Eugene Lloyd remind us of our history and heritage. During World War II, knitting, sewing and bandage rolling for the “Bundles for Britain” were added to the afternoon’s activities. This was also a precarious period for the club because the membership was down to 30 or 40 members. It was during this time that a formal organization, including bylaws, was put into place, which limited the total membership to 100. The late Barbara Daly, another early member and the president from 1961-1962, once recalled that members wore hats and gloves to every meeting, since it was a “dress-up affair”. Members provided the refreshments of tea, sandwiches and cake. By the 1960’s the club decided to have the teas catered. Mrs. Russell Smith offered the services of her butler/chef, Sterling Rainey, who continued to cater for 25 years or so. He also provided a program of two piano works. He is still the organist and choirmaster at the San Rafael Methodist Church. He was an honored guest at our 80th year celebration at Villa Marin. At that time the club purchased its own china, silver tea, and coffee service. Caterers, Eve Novak and Monique Braud, provided beautiful refreshments for us for several years. The Red Robin Catering Service has been featured for many years. There has been an impressive list of performers throughout the years. From our own membership we have heard soprano, Barbara Adams, pianists, Ann Nilsson Davis, the late Margaret Davis and organist, Melba Palmer. Some of the Adler Fellows from the San Francisco Opera Center who have performed for us, have become stars of the International stage in recent years. A few of them are Ruth Ann Swenson, Deborah Voight, Ann Panagulias, and baritone Hector Vasquez. We have also heard the talents of pianist Sally Christian, cellist Scott Kluksdahl, harpists Ann Adams and Dan Levitan, mezzo soprano, Dame Donna Petersen from the San Francisco Opera, Donald Pippin’s Pocket Opera, principal soloists from the San Francisco and Marin Symphonies. Over the years many instrumentalists, vocal soloists and chamber ensembles have delighted us. Currently, the club has approximately 70 members with annual dues of $100.00. Members may bring guests to a performance for a fee of $20.00. Please inform the Membership committee of Guests a week before the Meeting. The purpose of Thursday Musical Club is to provide an opportunity for our Northern California musicians to perform and to introduce new artists to our members. We are enriched and blessed with a wealth of incredible professional musicians in Marin and the San Francisco Bay area. We look forward to many years of beautiful music and the gracious gathering of friends.